Welcome to the January edition of QBN! I bet some of you wondered if it would appear in time! Its been a busy month for me (as I am sure it has for many of you also), though our reasons for this will vary, the outcome is much the same. No time to get those little but necessary things done! So here is a quick throw together (but I hope useful) news letter to satiate your curiosity. Web browsing – is it Becoming a Hazardous Past Time? The answer to this question is yes. To help avoid the traps one can slow down a bit and check before going there. You might see it as the equivalent of looking down an unfamiliar dark alley way before running down it. Not an easy new habit to adopt when rushing in a click-happy manner as we have been used to, but it may save you a lot of hassle if you can master it! So maybe a review of your current browser is needed? … so you can visit my site without any worries! If you are unsure of a web link that was sent to you through any media it would be a good idea to test it with this first if at all you are uncertain. 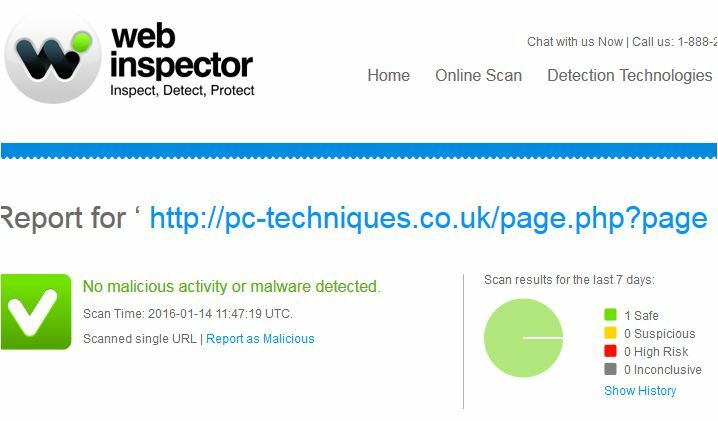 “Web Inspector is a cloud based service that inspects your website for malware, detects any vulnerabilities to being attacked and protects your website from thousands of security threats, daily! It also embeds PCI compliance scanning for E-commerce websites that accept credit card payments, to keep them compliant with the payment card industry’s mandatory standards“. Mal-vertising – a new vector for attacking your browser. Some advertisements are deliberately set to be served to you from malware infected servers and even for those not so nasty the experience of not being able to get to the materials you wanted to see because they block your views is annoying. These days persistent, nagging online ads can become overwhelming if you don’t have your defences up. I have mentioned measures to keep them in check in previous postings and so won’t revisit this now. But if you wanted to know more of the blizzard of channels they come from when you visit many well known media websites you could look here and if you wished, opt out (note:- from members sites only). DNS Proxy – A way to divert your website requests through a safe and manageable channel. Domain Naming System is the clever way the web signposts your website and other requests to get the request to the right server. Normally DNS is sent through your Internet Service Providers own DNS servers and the quality of those can vary. Happily there are some which allow you to send your traffic through them instead which allows you to specify filtering and other controls which can stop some of the web-rubbish from affecting your computer. Open DNS is just one of these which you may want to consider using. Anti Virus Browser Toolbars (extensions) are BAD for your browser! According to a new article “whatever antivirus program you use, don’t install the browser extension. If you already installed it or weren’t given a choice (many install their extensions by default), visit the Extensions, Add-ons, or Plug-ins page in your web browser and disable any extensions associated with your security suite“. Intrigued, I read that even with well reputed AV products such as AVG, Avast and Norton you could be opening your browers to potential attacks unnecessarily because they use code from another source (Ask) which isn’t properly secured and in use may also prove themselves to be traitors because they set out to serve you adverts you don’t need or want. So the best advice is to remove any toolbars that your AV vendor has packaged in and let the browsers own security measures handle the necessary security tasks. Naturally I assume you have the newest version of your browser installed if not you know what to do. So enough said I myself will now take the appropriate actions! As always I am very happy to take your enquiries for how I may help you with any of these tasks, all you have to do is contact me. More in February, and bye bye for now. Seasons Greetings, and welcome to the December edition of Quick Bytes News. In this edition I have reviewed online data storage services and compared them to our own Stroud Cloud service. This is an exercise I do from time to time to ensure that our own services are ahead of, or at least in line with competitors elsewhere. In my research I soon found that some competitors offerings have changed…. and then changed back, another was bought up and closed down, and others have morphed into bigger versions of the same but not become any more secure. As a backdrop to my writing I offer you these images from the web which illustrate my points. One can see quickly that as this developing and hotly headline grabbing industry tries to bamboozle the customers with ever more features, name changes and falling prices, it blindly follows in the wake of predecessor businesses that did the same and then saw a need for dramatic U-Turns or sellouts / buyouts to get-out of the doo-doo that they raced into. 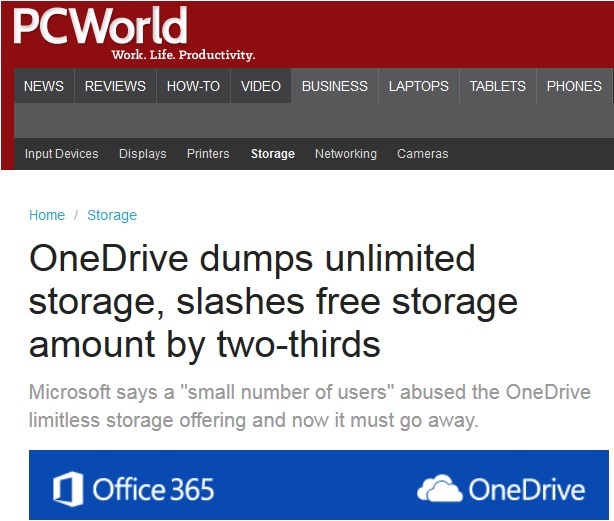 “Office 365 subscribers aren’t the only people getting cuts in their storage limits. Starting in 2016, free users will only receive 5GB of free storage, down from 15GB. Microsoft is also discontinuing the 15GB camera roll storage bonus that allowed mobile users to upload their pictures to OneDrive. Like the free tier, the camera roll will stop in early 2016. As with Office 365 subscribers, anyone on the free tier and/or using the camera roll will have “at least” 12 months to pull their data out of OneDrive and get below the new limit. Microsoft is also doing away with the 100GB and 200GB OneDrive paid plans priced at $1.99 and $3.99 per month respectively”. As well as rising prices and in some cases, falling quota limits, I have also seen that it is still a small minority of online storage providers who actually offer SECURE Backup Data Storage of the Stroud Cloud variety! The vast majority only offer unencrypted data sharing (or replication) services. These are OK for replicating non important data across multiple platforms such as mobile devices and PC’s and for sharing files between group members, but it must be kept in mind that should one device be lost or stolen then the thief may well have access to all of the data shared by the group member who’s device is now in their hands. Further as these providers are in a state of constant flux and subject to the changes I mention above, can you be assured that the contractual obligations you signed up for will be observed fully by the new owner of the service? If you read my November edition of Quick Bytes News you will have seen that The Safe Harbor Agreement between the EU and USA has been found by the highest court in the EU, to be unlawful. So where your data is stored does now matter, legally speaking. Now I will compare this with my own Stroud Cloud Data Storage. As you may know I set out to create a backup storage system which is fully automated so ensuring that your data backups are not overlooked. I also set out to ensure that no readable data was out on the web unless it was encrypted before it left your computer, this way any interception of it or theft of it by any means would prove fruitless because only you hold its encryption key. To further reassure you I also offer that you can log into your own data storage portal and manage your data sets, this also enables you to restore data yourself. Otherwise I offer to do this for you. I also set out to get your data returned to you when needed quickly, instead of relying on broadband speed to get it back because when the chips are down you need it fast. So I offered delivery via physical delivery and restoration of your data. Your data is only stored in Stroud, never elsewhere! We don’t keep changing our business name or product name. We don’t get bought out by a competitor with all the unforeseen changes for customers data. When we create and store your drive images you don’t have to reinstall Windows and then go through all of the 100’s of updates, restarts and configuration changes all over again! Last Month I featured the perils of WiFi but this month I look into the future to bring you the opportunities of LiFi. LiFi is a light frequency broadband technology that uses light frequencies (unlike radio frequencies of WiFi) and so this may prove much less potentially harmful to living beings than WiFi appears to. LiFi would be transmitted to your device from light bulbs in your home that emit no light when not needed during daylight periods, but do emit broadband or other data signals. This means your signals are not overlapping with those from adjacent properties and it means an almost infinite number of frequencies are available compared to WiFi, for which the available frequencies are becoming exhausted. As always please do let me know if I can help you with your technological needs which include Repairs to Devices and Networks, Installations, General Guidance, Tuition and of course Secure Data Storage . Observations from a meeting I attended concerning Electronic Hypersensitivity Effects on Humans from WiFi (RF) Transmissions in the Home or Office. 14-11-2015. I have written this article mid-month instead of waiting until the onset of December which we all know as the month of buying and receiving gifts because this article may influence how you, the reader does this. I write this because I attended an important talk last weekend which highlighted the sheer scale of radio emitting devices which now exist in many homes and these emit concerning levels of microwave frequencies into your living spaces. Radio Frequency emissions (RF) do not travel in a line from a transmitting device to the receiving device, they radiate in all directions and so will inevitably contact human and other living bodies within the radio range of their design. As we all know now any street in the UK is also a veritable bath of emitted radio signals from all of the communication devices in buildings and carried by millions of us on our person every day. So whats all the Noise about? As I understand it, ‘the noise’ is about the large gap between the official safe limit for human exposure to microwave energy emissions and the one measured by medical professionals and the insurance industry’s own risk assessments. Outdated standards of safety that are still in use, state that harm is not caused unless heating of the body happens as a result of exposure to RF emissions, and these standards were written before our current knowledge of the harmful effects on human living tissue and its cellular structures were as well known as they are today. Manufacturers of the devices emitting microwave signals will put disclaimers with the devices they sell in very small print in its box, knowing that no one reads the small print as they rush to use the new device. Insurers avoid litigation by excluding any harm caused from devices from insurances, so they do know and yet the sales of these devices romps on regardless. User beware! Baby Alarms and Monitors, Door Bells, Blue Tooth headsets, Wireless Mice & Keyboards, Wireless Thermostats, Bluetooth in Cars, Utilities installed Smart Meters (Electric, Gas and Water), Laptops, Smart Phones and Tablets and the list grows constantly. “The World Health Orgnaisation (WHO) / International Agency for Research on Cancer (IARC) Classified RF as a Group 2 B ‘Possible Human Carcinogen” (2011). Despite this, there has been no attempt in the UK at disseminating this important information to the public”. I will not try to explain why medical professionals and scientists are alarmed at the rapidly increasing harmful effects being reported by doctors, but I do understand that because we human beings are bio organisms that are little different from other aninal species, we in common with them have never evolved to live in a smog of electromagnetic microwave emissions. It seems inevitable to me that at least some sensitive groups will be affected by microwave RF especially when exposed on a constant basis, and that some will be more seriously affected than others. Naturally the weaker are more vulnerable, the young especially because microwave signals penetrate their thin skulls more easily than adults thicker skulls if using devices against the head such as phones and bluetooth headsets.. The full detailed document giving details of medical and other studies is here. Its a long and detailed read but because safety controls are behind the wide scale deployment of devices inside our homes it is worth at least a quick scan over. You can try avoiding having too much in your living space where remember, you are the ones in charge as an important first step. Naturally some RF will enter your living spaces from nearby buildings and cellphone towers but those generally won’t be as energy intense because of increased distance. Refuse Smart Meter installations, you have the right to do this! From recorded data it has been found that these meters emit RF energy in very high powered bursts that are much higher energy than any device in your home. They have to get their signal out beyond your home to receiving stations and so the energy bursts they emit will be designed to get there through any walls or people in the way. And yes, they emit radially in all directions! They have been identified as fire hazards in homes in the USA by many fire departments so insurance cover may be hard to get. Use wired device connections where ever possible instead of WiFi, this can be achieved by using wires directly to the device from the router, or you could use your homes/offices power ring main to carry the signal using Powerline plugs which are not expensive. Once those are in place the routers and the devices WiFi can be disabled. Usage Habit changes – Try keeping any active WiFi enabled devices you retain in use switched off (or in airplane mode) or well away from sleeping inhabitants or close to where people or pets spend long periods resting such as lounges or beds. The greater the distance between peoples bodies and RF devices, the better. Disable the 3G or 4G when not in use as well as the WiFi, those G’s are very powerful and only are used when you are emailing or browsing the web. You can buy wired headsets which allow you to use the phone with it away from your body, so reducing your exposure to the highest energy density levels when in use. Tablets were mentioned as always using maximum power transmissions (unlike smart phones) so can be more harmful. 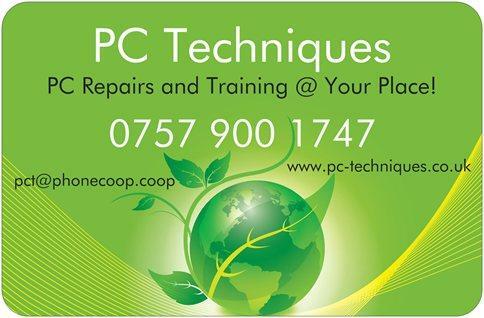 If you wish for PC Techniques to assist you with any technical changes to your systems do give me a call. Up to 30 minutes FREE consultation time. Welcome to the November edition of Quick Bytes News. In this edition I cover the recent change in EU law that now restricts the open door of the Safe Harbor Pact set up 15 years ago between the EU and the USA. Up until last month data in the EU could be transferred over to the USA without any formal process being completed, all that has now changed. Then I cover the newest intentions of Microsoft to coerce Windows 10 into your PC, beware! Finally I offer alternatives for your consideration from the well proven Linux stables, Mint and Ubuntu. Europe’s highest court has ruled that the 15 year old Safe Harbor pact between the EU and US is no longer valid. The ruling is likely to mean that personal data should no longer be transferred to US bodies solely on the basis they are Safe Harbor certified. “Personal data should no longer be transferred to US bodies solely on the basis they are Safe Harbour-certified. “It will involve lots of contracts between lots of parties and it’s going to be a bit of a nightmare administratively,” commented Nicola Fulford, head of data protection at the UK law firm, Kemp Little. “The model clauses themselves are standard form – what you need to put into them are details of the data involved and the security steps being taken. Stroud Cloud – Safer Harbour – I think! A little plug for our own Data Storage is in order because as many of you know our Stroud Cloud Data Storage service will never send your encrypted data anywhere else, it stays in Stroud! Please see here for details. Microsoft Announce they will be sending Windows 10 to you BEFORE they do it (this time, unlike last time). The ‘option’ of the Windows 10 upgrade window is again being forced open by Microsoft as they try harder to gain the momentum on this skeptically received new OS. “We will soon be publishing Windows 10 as an “Optional Update” in Windows Update for all Windows 7 and Windows 8.1 customers. Windows Update is the trusted, logical location for our most important updates, and adding Windows 10 here is another way we will make it easy for you to find your upgrade. Early next year, we expect to be re-categorizing Windows 10 as a “Recommended Update”. Depending upon your Windows Update settings, this may cause the upgrade process to automatically initiate on your device. Before the upgrade changes the OS of your device, you will be clearly prompted to choose whether or not to continue. And of course, if you choose to upgrade (our recommendation! ), then you will have 31 days to roll back to your previous Windows version if you don’t love it”. So be warned if you don’t like having your choices stolen watch out for their updates as they may be rather huge (last time it was 3.6Gigabytes). Alternatives do exist and they can be free! Maybe it really is time to look for a free and non coercive operating system, maybe one like Ubuntu or Mint from Linux and bundled with them you get a free Office compatible suite of programs, Libre Office. In this suite you get a Word processor, Spreadsheet, Database and Presentation programs much like MS Office. I have used the free Windows based version of Libre Office for a year and am very happy with it. The great offerings from the open source (Linux, Firefox, Thunderbird etc) community are well worth taking a close look at and they offer a much reduced attack profile from malware compared to Microsoft. Cafe Conundrums of the Online Flavour? Many of us like to take our mobile devices into public recreational spaces and as we are such busy bees these days we tend to fill every moment. With the explosion of hand held and lap/table toys we have its so easy to connect to anywhere and exchange all kinds of data. Naturally many will seek to check their bank account, maybe to see if they can afford something they are minded to buy or do. It has become so easy! Those of us in the I.T engine room tend to pick up on what others are doing which is why I flag up things that come my way which the public ought to know of, especially when this concerns their own banking or other security. Today I have read this account from Threatpost, a long established online security site. This one flags up concerns about ‘cookies’ (non edible type) and how smart crooks might be able to use them to break into your online security and perhaps steal your data or money. Previously cookies were fairly innocuous little text files which reported rather ordinary info on your browsing back to websites when you revisited them, mostly harmless and helpful stuff. (unless you have ‘drifted’ from the accepted norm, of course). So what is this dire warning? You can read it all here. But if your not minded to take it all in, the part that particularly caught my eyes is below. “The researchers said the vulnerabilities are present in a number of heavily-trafficked sites—they identify Google and Bank of America by name—and added that a number of consequences could include privacy violations, account hijacking and financial loss. This warning is probably a little ahead of the bad guys (‘n’ gals) for a little while so just for now I don’t think I will be giving up my out of home online habits, but do think it a good idea to be proactive in alerting people. Your browser can be set to automatically delete cookies on exit of the programme, however this may impact some of the websites you regularly use. So its best to set aside some time for testing if deleting cookies affects those sites you need them active for, at a time when it isn’t a pressure on you to use the site(s). Its a judgement you need to make to balance the convenience with the risk. Have you considered which browser is best yet? Do check out the Privacy & Security assessments sections that are done by various online test houses in articles like this one. These can be very useful in offering you a clear picture of browser features generally, although I suggest that you go directly to the manufacturers own website to download a browser you want. This is because many file distributor websites do earn revenues by adding advertising code to their ‘free downloads’. Otherwise you could end up with annoying new applications that annoy you with distracting ads! I read this week that up to 85% of smart enabled devices may be vulnerable simply because their operating systems are not updated, or applications with web access on them are not updated. The article is here. 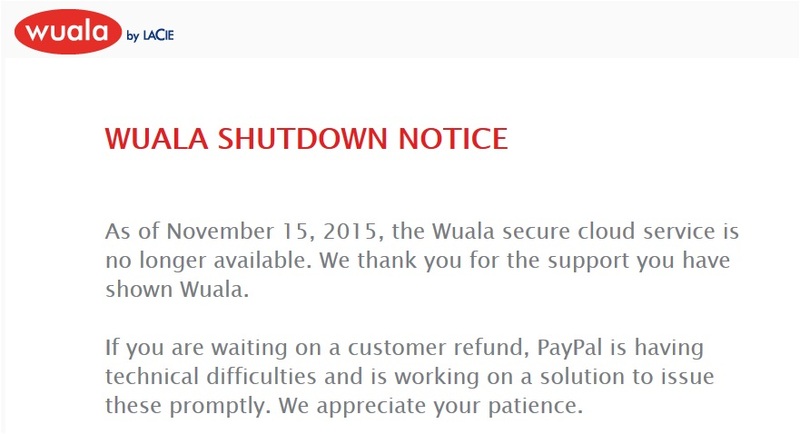 So if you use yours for anything financial, you know what to do. Spybot Anti-Beacon for Windows 10 – for those of you affected by Windows 10! “This is a small utility designed to block and stop the various tracking (aka telemetry) issues that come with Windows 10. Seeing the bunch of incomplete or broken scripts to disable tracking in Windows 10, and the tools that install adware or worse in exchange for their function, we wrapped disabling tracking up in a small tool that’s free and clean. Might or might not become part of the next Spybot, since it’s similar to immunization, but it’s needed now, and it’s still work in progress as more and more information evolves”. Naturally I will be very happy to help with any tasks mentioned above for you, perhaps as part of a general clean up / service of your PC or laptop. Welcome to the post holiday (where did it go so fast) edition of QBN which is published in this new online blog format. I hope that you like it. This edition covers topic’s that highlight the received wisdom of IT guru’s ‘out in the wild’. They say that to keep ourselves from having slowed down PC’s that may either betray us financially or drive us into accepting the Windows 10 hazard we need to pay close attention. I for one am listening! You may have become of an opinion that I am not as enthusiastic about computers as some. This is understandable because I am very aware of our common vulnerability online these days. We need to be online now because it is no longer an accessory to our lives, it has become a necessity! And stories like those below show that its not only malware and virus writers who wish to invade our online experience. Its some Manufacturers as well so I am wondering what the differences are between them these days! Is Windows 10 – Is knocking at your door with added determination! We all have seen how the new white logo of Microsoft has appeared in our system trays over the past few months, and have realised that this heralded the arrival of Windows 10. We have seen it make pop ups from time trying to ‘enhance our online & PC lives’ by constantly offering Windows 10 to us for ‘free’ (nothing truly is I hear you mutter). Well it has now been revealed by those who watch the horizons for hazards, that the kindly intended little people from Microsoft have been ignoring our ‘No Thanks’ replies to their Windows 10 offering and have been secretly downloading it onto our PC’s behind our backs! If like me you are concerned that this has used up 3.5Gigabytes of your hard drive space and that it has slowed down your broadband as well as using up any quota that your ISP allocates, then you are in the same mind frame as I. You might use the next few minutes to have a cuppa, absorb this information, rage and determine to change things to how YOU, not they would like it to be. We are the customers of Microsoft, right? We pay for their products which has made them what they are now – dominant, huge and uncaring! 2) Restart the PC and then return to the Windows Updates and search for Updates. the removed updates will appear in the list to install. Right click on each and select Hide to keep them out! $Windows.~BT, $Windows and ~WS. These are hidden folders. Make sure Windows is set to show hidden files if the folders aren’t visible. The best way to remove them and regain disk space is by using the built in Disk Cleanup tool. There! – Job done and so now you remove the risk that one day when your not quite on the ball you accidentally click a ‘Yes’ button that popped up when you were already busy and end up with an unreliable new O.S. These days things have become different to the old days when a ‘nasty’ of some type got in by a downloaded file, USB copied file or CD/DVD file. These days its the browser that is the most likely way to acquire a problem and without downloading anything. Your PC, Mac or even Linux PC can be infected by malicious code squirted in when you click on a malicious advert or a compromised website of which there appear to be many out there. those impacting ads that set out to shock, titillate or amaze are particularly dangerous. Its common practice these days for legitimate websites to carry adverts from third party sources to increase their revenues but because these come from third parties they are not vetted by the website creators/editors themselves. This means that standards of security are being threatened with dilution every time another ‘party’ is added to the chain. The more links in a chain the weaker it can become, especially if the ‘chain vendor’ sub contracts out the link making to others who’s standards may be weaker. So what can you do to protect yourself, now that the web has become so important to many of us? a) Firstly you need to get rid of all those toolbars in your browser(s). You don’t need most, if any! Some have crept in and others came in bundled up in ‘freeware’. Try uninstalling them in Control Panel – Programs. b) Next check inside your browser(s) for any left over add-ons and remove them as well, less is more security! c) Next make sure your browser(s) are all updated to the newest (most secure) versions. d) Harden your browser(s) with free tools like NoScript, Ghostery, AdBlock Plus and most importantly, Malwarebytes Anti Exploit. (free). Please remember to check occasionally that these tools are also up to date. e) If your bank enthuses for you to use a security software (such as Trusteer Rapport) when connecting to their online banking then do use it! But only take advice on that from the banks own website itself or their own printed literature. Never follow instructions from an unsolicited email or phone caller purporting to be from your bank! Microsoft and the UEFI story – a warning! Does your PC have this file on it at C:\Windows\system32\wpbbin.exe. ? Out in the wild is a fake Starbucks Survey offering goodies for those who fill it in. Don’t its another scam and you will need another type of drink if you get scammed by it.